Death is a scary word for many people. Yes, it is inevitable and unpredictable as to when, but everyone can be ready for the coming of that day in terms of the funeral program. 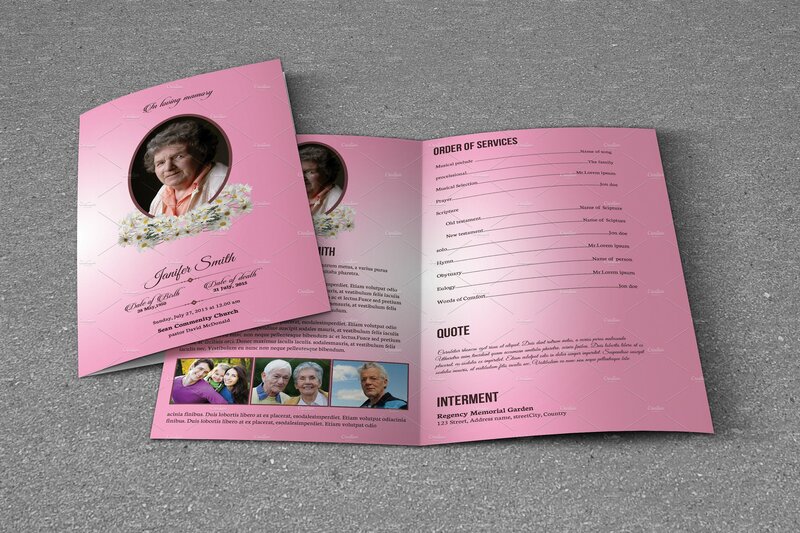 A funeral program is also called a funeral brochure. 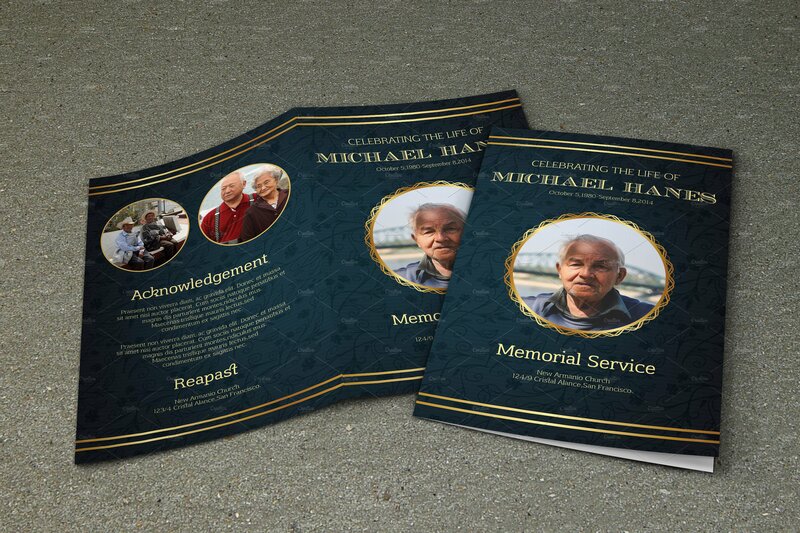 It is a printed document that presents a funeral notice and a memorial service program, summarizes the achievements of the deceased, and outlines other important information of the funeral. It is quite strange and creepy to say that you can prepare for your own funeral brochure, but usually, the family of the deceased is the one preparing it. 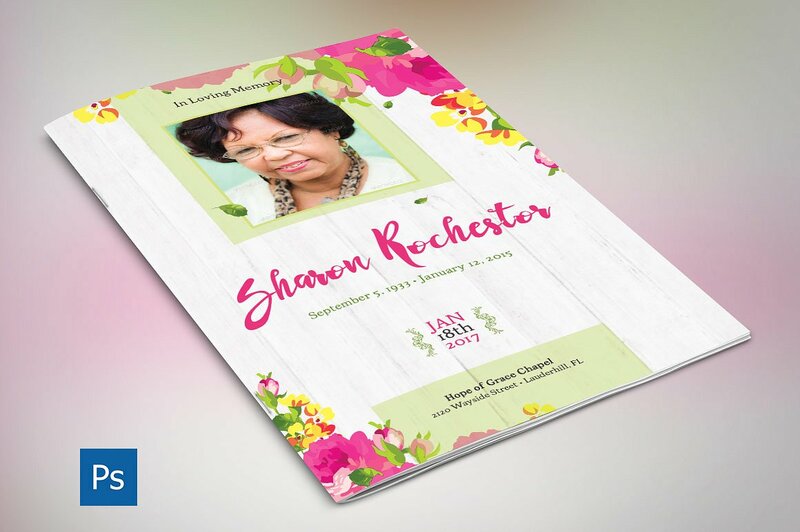 There is really no absolute rule in creating the elements of your funeral brochures; the above discussion merely presented the key points to remember and what to include in the brochure. 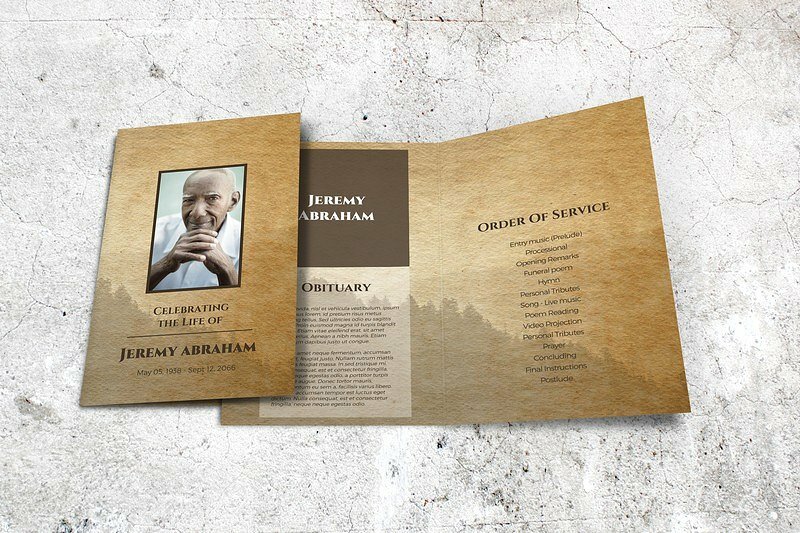 Unlike any other sales promotion or marketing brochures that emphasize on the products, goods, or services that a company is offering, the funeral brochure provides information regarding the funeral, giving highlights to the service program. 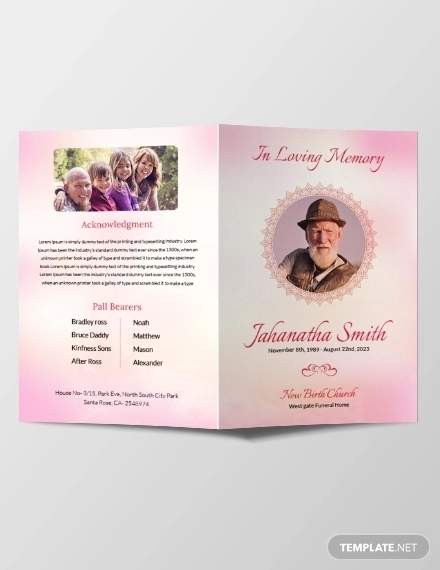 You may also consider the following samples of funeral brochures that will greatly help you in your funeral program. 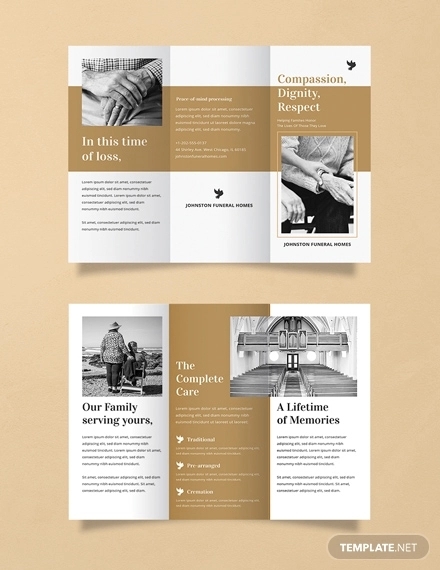 As the word itself, “bi-fold” funeral brochures are brochures that are styled and folded into two with all four panels having information regarding the funeral service and other related information. In this type, the information are congested to fit into the panel. 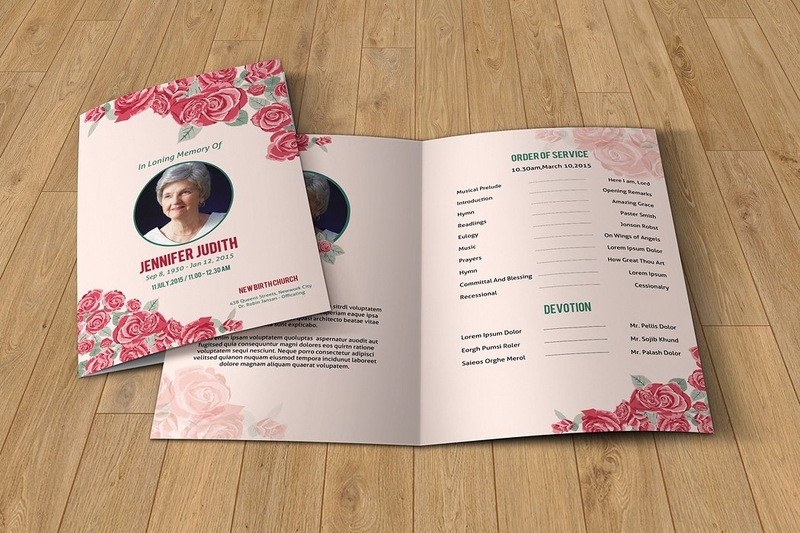 Most of the time, people prefer this type as this can conserve space and still retain its elegance, and this is the most typical style of most of the funeral brochure templates. It has many features similar to bi-fold funeral brochures, only that it is folded into three. All in all, there were six panels. Just like bi-fold, it conserves space since the edge of the paper can be maximized. The margin for this type is usually very small, the reason why lengthy contents can usually be fit into the panel. For aesthetic purposes, some designers would fold the paper unevenly such that the first panel is just a half or two-thirds of the second and third panels. But whatever your design is, the important thing is that your content is complete and the elegance and formality is retained. The reason why many people choose vintage style is that they said that it never goes out of style. 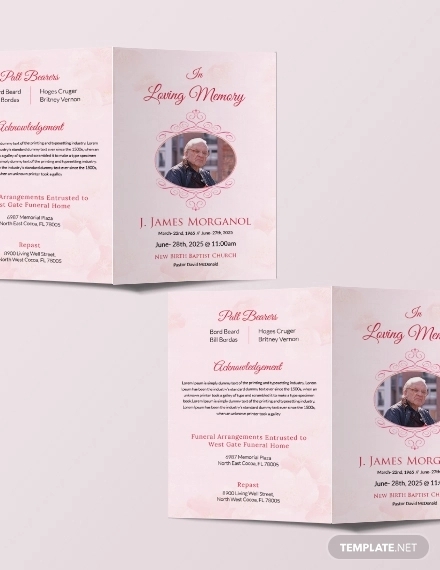 Another advantage is that whatever color of the whole set up design is, vintage designs for funeral brochures can blend along. Vintage designs are tailored in a fashion that it can complement with any other colors. It has also an ambiance of being classy and formal. Classic brochures are the ones that are typical to most of the people and those designs that we are already accustomed of. Many people also prefer this one as the appearance of classic funeral brochures is simple and formal and the designs are minimalist. It is designed in a way that it can fit the personality of the deceased may it be a child, middle-aged, or senior citizen. That is the flexibility of this design. 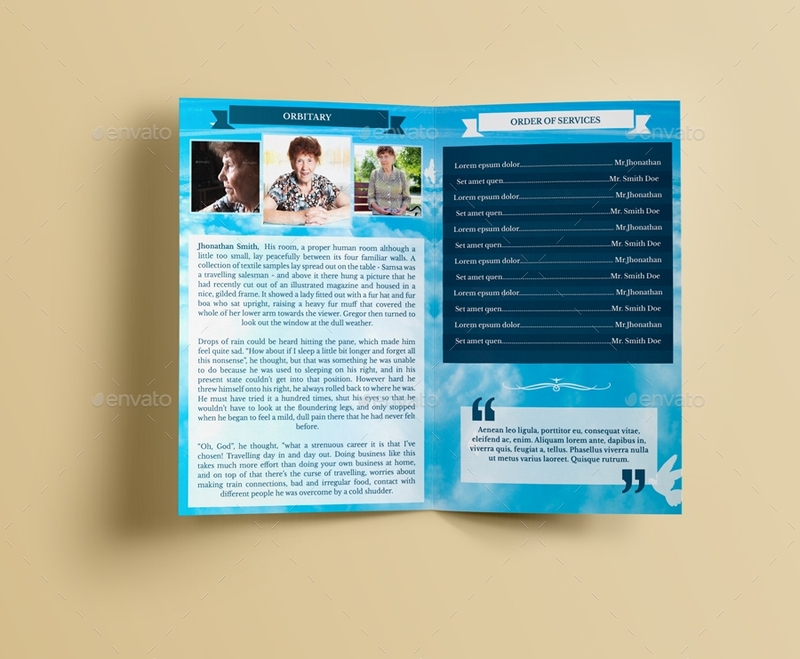 Brochures of this style include watercolor designs in the face of their brochure, making the appearance of the brochure more flowy and loose, just like the characteristics of a watercolor. A flower design is created through the use of a watercolor. Traditional artists may create them using their own bare hands, but this can also be done by digital artists, only using watercolor prints instead of a real application of watercolor to the surface. This adds a little life to the brochure. A little color for the brochure may cheer up the family of the deceased even just for a little. A little splashy effect may also do the trick. Splashes of colors can trigger one’s imaginative minds. Warm mix of colors may be perceived as a strong emotion, while cool colors may be perceived as a chill and relaxing one. However, it is just all in the perspective of the viewer in interpreting colors. But this can really help in the visual effect of the brochure. 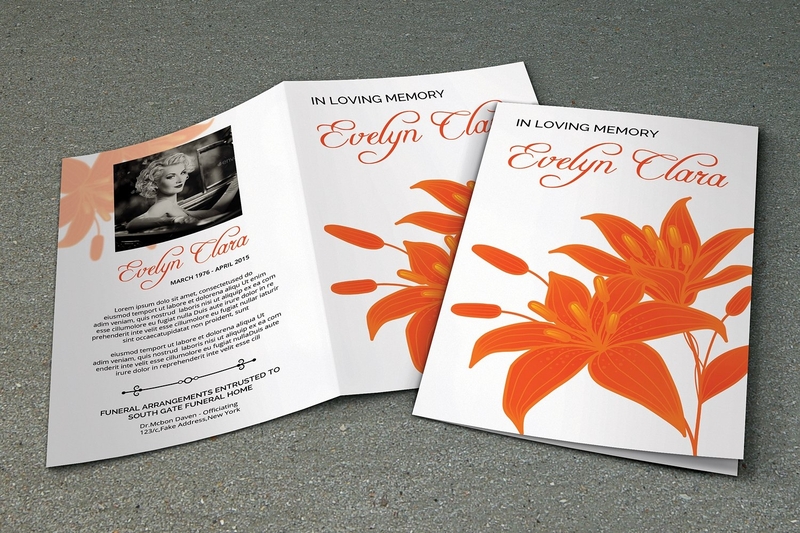 Cardboard-style funeral brochures emphasize the cardboard design on the brochure. May it be a real one or just a print, the purpose is to create a cardboard-effect design for the brochure. Even if you say that it is just for visual purposes, it enhances the design and grandeur of the brochure. The above image presented floral design that is designed to somewhat cheer up and create positive energy to the viewer. Aside from giving creative impact to the brochure, it also gives the feeling of encouragement. 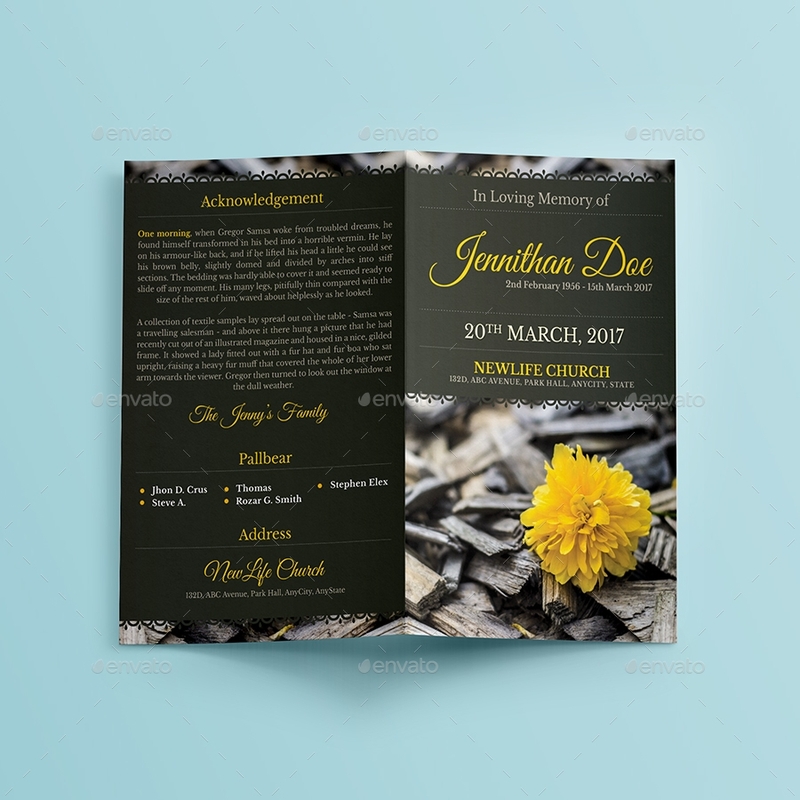 If you are considering a design similar to this one, just make sure that it will not look like a wedding invitation than a funeral brochure. In the image, as compared to the previous one, this has only a minimal flower design. You might also want to have this kind of design since it does not only add artful effect but also retain its graceful layout. 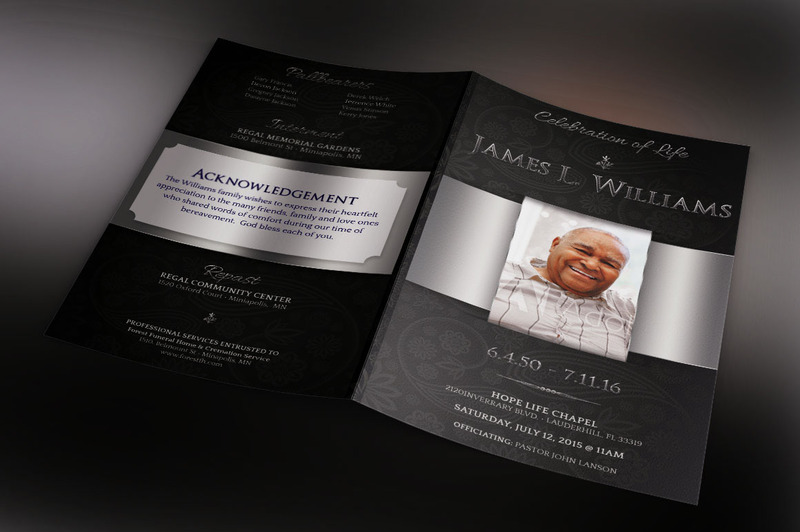 Why Are Funeral Brochures Important? It is informative. Brochures should contain complete information that guests and other people might be asking. These include the time and date of the service and funeral, complete information of the deceased, the surviving family members, the order of the activities of the service, and much other important information. This is why you must take time to check the things you have written in your brochure as this serves as a guide to the people. The information can easily be disseminated and the error in the dissemination of the information can be prevented. Because people may have different versions of information if it is just passed orally, a brochure can help since the information presented here is precise and can’t be changed. It also serves as a proof to those who are in doubt of the information that they have received. It clarifies schedules. This is related to the sequence of the funeral event. It may be chaotic and out of order if there will be no clear outline of the funeral event. This can aid in the preparation of the speaker, the setup, as well as the sound system and all other important elements during the funeral service. Guests can stay on track. Guests can look forward and will know what’s gonna happen next if they have the brochure. They can stay on track of what is already happening and can estimate the time they can leave if ever they have another important appointment afterward. It is handy. Because most of the brochures are small in size, it is handy for the guests and it can be easily placed in their pockets or bags, for example. Given the information above, whatever design you are considering, remember to include the important key points of your funeral brochure especially the one cited in the first two paragraphs. The designs are just supplemented to your important information. Always remember more importantly that this is for someone dear that has already left this world and may hopefully rest in peace.